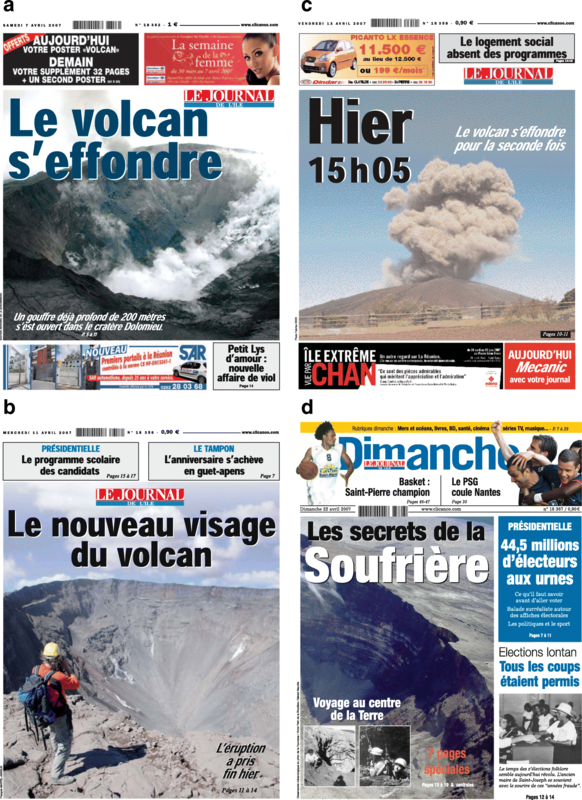 An analysis of the front pages of 120 consecutive editions of the local newspaper for the island of La Réunion (France), “Le Journal de L’Ile de La Réunion”, published before, during and after the April 2007 eruption of Piton de la Fournaise reveals that its front page is an ideal vehicle for maximizing information delivery and recall during a volcanic eruption. Supported by flash tests, and by cross-checking with a content analysis of information given within the newspaper, we find that the front page is an effective gauge for the hazard frame which, for the case examined here, involved six volcanic hazards (pit-crater collapse, lava flows, gas, air fall, ocean entry lava flow and bench collapse), as well as the issue of evacuation. We found that crater collapse and lava flow hazards were framed using their natural colors and clear imagery of the phenomenon, tied to context-setting explanations within the newspaper. However, for lava flows in particular there was an element of spectacle and promotion of sightseeing, with photographs always featuring sightseers invariably taking photographs. After the end of the eruption reporting became almost entirely focused on tourists and sightseeing. Gas and ash fall hazard were framed using images and words of the victims, so that it became worrying and frightening, and associated with panic. As a result, the volcano itself became portrayed as a monster, and the situation for the impacted population became “apocalyptic” and “hellish”. This probably contributed to the evacuation measures being described as confused and pointless, with the morale of the impacted population suffering accordingly. The ocean entry and bench collapse had no frame at all, and became associated with the dead, exotic fish that were collected; this hazard thus being framed as an interesting curiosity rather than a volcanic hazard. The front page-tracking model followed here could guide future educative measures during volcanic crises by quickly identifying, on the basis of front page analysis, hazards that are appropriately conveyed versus those that are poorly portrayed. Responses to rectify a poor frame can include reactive scientific advertising, a route that is used commonly by businesses seeking to boost sales by taking timely advantage of a developing newspaper frame, and distribution of appropriately designed and timed press releases. The public can then use such cues to organize their own agendas and to decide which topics are important (McCombs 2014). Bogart (1955) thus argued that “the mass media provide a natural source of conversational material,” with the content providing an “array of collective images” that can be “introduced into conversation.” That is, the way in which the information is given “frames” the event, influencing the perception of that event amongst the recipient population (Reese et al. 2010). In hazard communication and education it is fundamental that we define the components of such frames and recognize the message thereby communicated so as to allow an understanding of the readership’s perception of, for example, a volcanic eruption impacting their community. For example, how will the reader viewing the three front pages of Figs. 1, 2 and 3—all of which were published in the local newspaper that serves the Island of Réunion during the April 2007 eruption of Piton de la Fournaise—view the volcanologist, volcanology and the on-going volcanic emergency? Our aim here is thus to assess the effectiveness of newspaper design in framing risk, hazard and response during a volcanic eruption, using the April 2007 eruption of Piton de la Fournaise (La Réunion, France) as our case study. This was the largest historical eruption of Piton de la Fournaise (Staudacher et al. 2009), with a short initial phase which began on 30–31 March 2007 being followed by a main phase that began on 2 April. While heavy tephra fall affected an area to the SE of the vent, gas effects were felt as far away as Mauritius (220 km to the NNE) and the village of Le Tremblet was evacuated (see Part 1 of this study). The eruption continued until 1 May 2007, cutting the island perimeter road, causing two major collapses of the Dolomieu Crater, setting up a major ocean entry (Staudacher et al. 2008), and leaving a deep and lasting impression in the minds of the impacted population (Payet 2007). 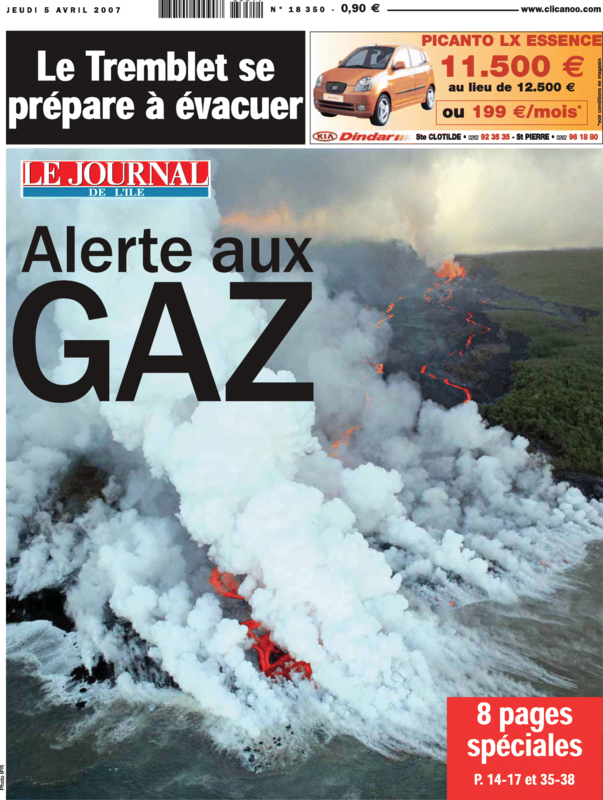 Le Journal de L’Ile de La Réunion (JIR) is one of the two main island newspapers, and between February and May of 2007 hazard-related information appeared on the front pages of the JIR on 34 out of the 120 publication days and accounted for 21.94 m2 of newspaper space (see part 1 of this study Harris & Villeneuve, 2018). As we argue in Part 1, the opportunity to communicate, and thereby also educate on, volcanic hazard was thus maximized. Here we carry out a content analysis of this published information, focusing on the format of the messages displayed on the front page of the JIR, to assess the way in which that information was framed. This information, following the social amplification of risk framework (SARF) of Kasperson et al. (1988), and as evolved by Kasperson (1992), Kasperson and Kasperson (1996) and Kasperson et al. (2003), will inform on how the risk or hazard is perceived by the receiver (i.e., the readership) and whether or not the risk is amplified or attenuated. The hazard frame during a volcanic crisis thus needs to be defined and tracked if we are to understand how information is received and perceived by newspaper (and other mass media) readerships and, most importantly, how we can better communicate the desired message to the wider population during a volcanic emergency. Rowe et al. (2000) argued that, while the quantity of coverage of hazards will be a major influence on risk perception amongst an incident population, the way in which the media present the hazard information will also influence reader perceptions. That is, the media will report the hazard in such a way so as to encourage a certain perception of the event (e.g., Dawson and Lyons 2003; Washer 2004; Wallis and Nerlich 2005; Höijer et al. 2006). Thus, in the context of content analysis, framing becomes defined as the presentation of information in such a way that a particular interpretation, view or evaluation of an event is promoted (Entman 2004). This is the definition of “frame” and “framing” applied here, where information regarding the volcanic hazard passes through a series of filters that mean that information is organized and described (Kahneman and Tversky 1984) in a way so as to promote a particular interpretation (Harris 2015a). The front page layout of a newspaper, for example, is carefully designed to display a clear message that makes a person want to buy the newspaper, while giving the reader something to think about (Rowe et al. 2000). In providing cues through pictures and colors, plus through delivery of a few, large, bold, evocative words in the headlines, newspaper front pages are extremely effective in delivering an immediate message (Naccarato and Neuendorf 1998); thereby framing the featured event (Reese 2010) and downplaying--through selecting and highlighting certain events over others (Entman 2004)--another (c.f. Figs. 1, 2 and 3). It is quite clear, for example, how the selection and use of images in the examples of Figs. 1, 2 and 3—all of which were published during the April 2007 eruption of Piton de la Fournaise—frame the natural hazard. In the case of Fig. 1 the event in which we are interested in communicating (the volcanic eruption and its hazard) has no presence and thereby goes unnoticed in spite of continued impact on communities in the SE of the island; the featured focus being an eye-catching distraction that will likely leave a lasting impression in the viewer’s mind. In Fig. 2, the eruption is a secondary frame which is easily missed—being only given in text above a primary frame which is framed in image and text and which dominates the page. Again, both the text and imagery of the featured focus will likely dominant the viewer’s attention. In Fig. 3, the volcanic hazard becomes the primary frame. In all cases, the primary frame has been set up through design. Repetition and familiarity enhances ability to memorize a word list (Ebbinghaus 1885; Tulving 1985). Baddeley et al. (1975) argued that memory span is equivalent to the number of words that can be read in two seconds, where extensive testing has proved that 7 ± 2 “chunks” of information can be held in the short-term memory (see Cowan (2000) for thorough review). All of this leads to the conclusion that the most effective headline delivery is achieved with a short (7 ± 2 word) string of short, popular, familiar words, of interleaved middle and short length words, with the most important words appearing at the beginning and end. Thus, the advice in most journalism textbooks is to (i) never use a long word, when a short word will do; (ii) if it is possible to cut out a word, then cut it out; and (iii) never use foreign, scientific or jargonized words when an everyday equivalent is available (Harcup 2009). Atkinson (2011) adds two rules when writing a headline: (i) write concise sentences with a subject and a verb in active voice, and (ii) be clear, direct, specific and conversational. We see this put into play in the four headlines of Fig. 4 where the length of the headlines is 6 ± 3 words, word lengths are generally short, involve a mixture of short- and medium-length words which are simple and familiar, with the most important words being placed first and last in each headline. In short, the design of each slogan will maximize the chance of short-term memory storage of most of the headline. In addition, messages are more quickly ingested if delivered in easy-to-read fonts, with display of selected words in uppercase, bold, larger size and/or color font being extremely effective in focusing the audience on the key message (e.g. Duarte 2008; Dirkson 2012; Reynolds 2014). Again, use of bold and color can be seen in setting up the headline hierarchy of Fig. 4. It is also well-known that human-beings have a “vast memory” for pictures (Standing et al. 1972; Standing 1973), so that image-based messages can be much more memorable than texturally or verbally delivered messages (Paivio and Caspo 1973). Effective message delivery can thus be achieved through just a momentary glance at an image (Standing et al. 1972), with images containing a concealed object (or obscured object) being just as effective for mnemonic purposes as one in which all objects are pictured, although the latter is certainly a much more vivid communication means (Neisser and Kerr 1973). Use of appropriate imagery is also an effective communication device to enhance learning (Dutrow 2007). Carney and Levin (2002) thus argued that “whether ancient cave painting or computer screen icon, pictures are part of the human experience,” so that “carefully constructed illustrations” are “effective text adjuncts” in message delivery. Although pictures are more memorable than words, to achieve ultimate memory recall, pictures and words should be used together (Mayer and Anderson 1992). This especially applies to those with little knowledge of the theme being delivered. Mayer and Syms (1994), for example, found that. The subject being visually apparent. In addition, Martin-Lagardette (2009) recommends, when considering imagery for inclusion on the front page of a newspaper, a preference for images that include faces or people. We can again see these design influences being applied in the front page example of Fig. 4. Thus, the agenda laid out in words and pictures in prominent newspaper positions will be a powerful influence in focusing public opinion on particular themes, issues or viewpoints (e.g., Katzman 1972; Morris and Peng 1994; Rowe et al. 2000). The front page design, and the frame this creates, thus needs to be considered in any content analysis aimed at understanding the effect of the news format on readership perceptions of a natural hazard. Front page flags (FP-F): that is, text boxes at the top or sides of the front page pointing readers to the most newsworthy stories inside the newspaper. Front page spread (FP-S): this being the “story-of-the-day” featuring a large color photograph that dominates the front page with the primary (largest font) headline inset. The text of all front page headlines were recorded, the type of hazard to which they referred assigned a class (following the coding system laid out in part 1), and the theme and dominant color of each image noted. The number of words in each headline, and the number of letters in each word, were also recorded, and images assigned a binary code depending on whether people or faces were present (1) or not (0). Internal articles relating to volcanic activity were processed following the methodology laid out in part 1 of this work. We then carried out a “flash test” to assess the effect of the front page information content and design on the short term memory of the casual observer. The test followed the format of the short-term memory tests of Baddeley et al. (1975) whereby ten front pages on which the volcano and its activity was featured as the main image and headline were displayed for 1.5 s. Between each display, subjects were given nine seconds to write down those words that entered their head, before being given a five second stop cue, and then a five second pause during which a black screen was displayed. The next page was then displayed. The second test involved the display of only the front page flags. The test was the same, except that 11 front page flags were displayed, and the subjects were given just four seconds to write down all words they could remember from the text in any sequence. Finally, as a control, a front page on which the volcano was featured only as a front page flag, and one where no volcanic information was given, were displayed. The tests were applied to three groups, two with knowledge of the volcano and its activity, and who were regular visitors to active sites, and one with no such experience. The two experienced groups were all 19 staff members (research, operations, technical, administrative and non-permanent scientific members) of the Piton de la Fournaise Volcano Observatory (OVPF), plus 52 tourist-guide professionals attending a training program for guided visits to active sites during eruptions. The inexperienced group was 24 third year geography students at l’Université de La Réunion (St. Denis). Words recorded in each test were then placed into one of three classes: impacts or volcanic processes, normal life and perturbed life. A total of 23 front page articles devoted to volcanic activity (13 front page flags and 10 front page spreads) appeared between February and May 2007, of which 16 appeared during April (Table 1). The average number of words appearing in front page headlines relating to volcanic activity was 5 ± 2, with a mode and median of four. This compares with 4 ± 2 for all front page headlines appearing over the 120 days of the study period, with a range of two to nine, a median of four, and a mode of three. 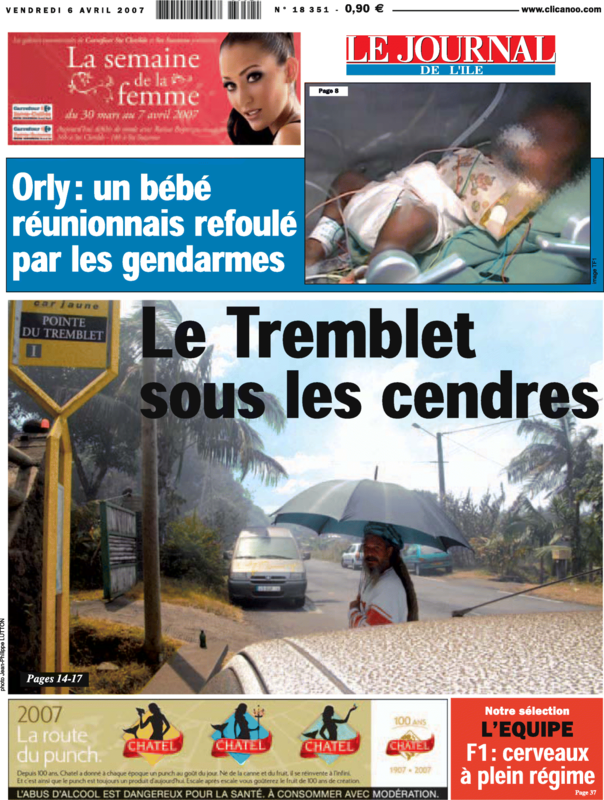 Headline placement at top reading “Le Tremblet prepares itself to evacuate”, which in French is three moderate-length (7–8 letter) words separated by three short (1–2 letter) words, making it a perfectly-sized phrase for ease of recall. A sub-element involving three, short, simple words (Alert to GAS) in a large, bold font, with the hazard (Gas) being capitalized. The image expressing the subject takes up 83% of the front page. If we examine the front page examples given in Figs. 5 and 6, we see an identical design in terms of word and imagery use and layout. Given the recommendation of Martin-Lagardette (2009) regarding inclusion of people or faces in front page images, we also checked all front-page spread images for such a preference. Of 117 front pages examined over the four month study period, a face or a person featured in 91 of them. That is, 78% of the front pages featured a person carrying out an action. When associated with hazardous situations this involved firemen, policemen, civil protection officials or coastguards; meaning that in each case a responder was pictured protecting structures, responding to crime, assessing a hazard, or rescuing people. Note, for example, that the main images of Figs. 5 and 7 include people, with Fig. 5 including a policeman (Gendarmerie)—even if he is in the second row and taking a photograph. What volcanic hazards did the front page focus on? Thus, in terms of word repetition, the material damage (to the road) caused by lava ingress and the need for evacuation (of Le Tremblet) were the most important issues. These were texturally linked with the generic hazard due to the volcano or the eruption, rather than specific hazards such as lava flow, air fall or gas. In terms of individual hazard, lava + flow was the most frequently used (three occurrences), followed by gas and collapse (both with two occurrences), and then seismic, ash and sea each with one occurrence. In terms of the dominant theme of the front page, this began with lava and the crossing of the road and ocean entry on 3 and 4 April, respectively. Focus then switched to gas and air fall on 5 and 6 April, respectively, before becoming entirely focused on the collapse of the Dolomieu (on 7, 9, 11, 13 and 22 April). This was in spite of the fact that the main collapse occurred on 6–7 April, but ocean entry and lava flow continued throughout the eruption. 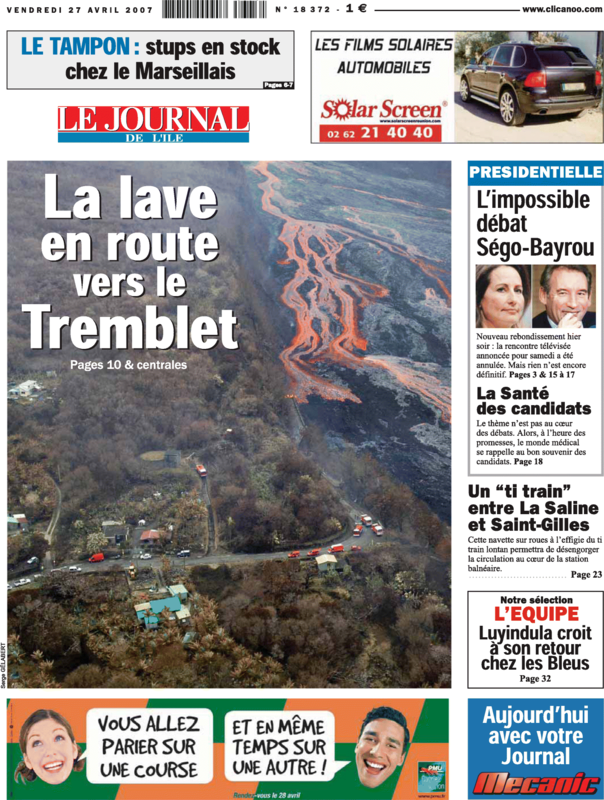 The threat of lava flow invasion to Le Tremblet only became a focus again on the final front page that featured the eruption, that of 27 April, when the eruption had more-or-less ended. Thus, the reporting of hazard followed the primary activity type until 7 April, when the focus became distracted by the collapse of the Dolomieu; the “hazard-of-the-day” being demoted to an (often-poorly framed) front page flag (e.g., Fig. 7). ○ “show”, “mystery”, “new face”, “secret”, “open” and “view”. The event-frame thus evolved from one of alert to one of show; attracting sightseers who took photographs from a close distance, with the time-frame invariably being “yesterday” (Table 1). After that, all other words recorded were the same—with the exception of “fumes”, which was only recorded by the student group. Interestingly, the OVPF and guide groups both had “Dolomieu” and “flow” as the 4th and 5th most commonly recorded words, whereas the student group had “road” and “fumes”. This no doubt reflects better familiarity with the volcano and its products amongst the former two groups than the latter, with fumes being the association of the students with the plume. The OVPF staff, guide and student groups respectively used 235, 251 and 216 different words to describe the ten front pages displayed. However, imagery and headline words failed to conjure up feelings of risk, hazard or loss, instead they evoked reactions such as “red”, “hat”, “sea”, “bus stop”, “new” and “face”, the only hazard-relevant word recorded being “chaos” (Table 2). In the case of “hat”, this was due to the silhouette of a sightseer being prominent on the front page of the 4 April edition of JIR (Fig. 6). For the flash tests completed for the front page flags, all three groups retained 3 ± 1 words, and all three groups recorded 56 different words. There was a weak positive correlation (R2 = 0.6) between the number of words in the text and the number of different words returned by all participants. All words in the text were returned only for cases less than six words in length. We recorded retention of hazard and risk words in the first three cases (Table 3); thereafter words such as “show”, “fish”, “mystery”, “open” and “view” dominated. When, given the front page of 31 March (Fig. 2), no respondent noticed that the eruption had begun—as announced by a front page flag in the top-left corner of the page. Volcan: 135 euros pour avoir vu les coulées de trop près! coulée (10); Brulée (9); Grande (8); route (7); aout (5); pas (4) (flow, burnt--although this is associated with the place name, Le Grande Breulée ... hence the next word--Grande, road, August, not). If we examine the class of word retained from flash test results for both the headline and front page flag, we find that the statistics are again identical for all three groups (Fig. 9). Although words associated with volcanic hazards represented up to 60% of the words by type; typically less than 11% were words associated with a perturbed life. In fact, for the text boxes, around 60% of the words were associated with a normal life (Fig. 9). Hence, the perception of the event was not one of alarm, but instead the imagery and text used framed the event as non-risky and safe; even approachable and exciting. Because of the excellent design of the front page of JIR in terms of maximizing information delivery to the short-term memory, it is important to understand what message was likely received by the readership and how that framed each volcanic process and its associated hazard. We here discuss what that message was, and search reports deeper in the newspaper to understand if this message was supported by the detailed reporting within the body of the newspaper. We then finish by exploring what were the effective elements of the framing process, so as to provide guidelines as to how the volcanologist can define, track and respond to frames in the mass media. Our content analysis shows that only the well-known (pit crater and lava flow) hazards were framed in a way that provided effective hazard communication that could achieve the disaster managers goal, that being to educate the population through reporting in the mass media (e.g., Coppola 2015). Instead, gas, air fall and ocean entry hazards, as well as evacuation plans and the functioning of decision making system were poorly framed, thereby failing as an educative measure. Instead, they served to further engender a frame of entertainment, uncertainty, fear, panic and failure. That of 7 April 2007 (Fig. 10a) was entitled “the volcano collapses”; featuring an image of the crater (Table 1), that was recalled as “volcano”, “collapse” and “crater” by the flash tests (Table 2). That of 11 April 2007 (Fig. 10b) was entitled “the new face of the volcano”; it featured a man taking a picture of the crater (Table 1), who four members of the OVPF staff recognized as being Thomas Staudacher (Table 2), the director of OVPF at the time of the eruption. That of 13 April 2007 (Fig. 10c) was simply labeled “yesterday 15h05”; giving an image of the brown plume resulting from the collapse (Table 1), that was recalled as “cinder”, “plume” and “yesterday” by the flash tests (Table 2). People were rarely included in imagery of summit collapse, with a person appearing in only one of the four front-page spread images that appeared during April 2007. In terms of internal reporting, the risk of crater rim instabilities and collapse was well-known, having already been stressed in a 29 March 2007 report by Martel-Asselin (2007a). On 4 April, a page 11 report focused on the potential of summit collapse, quoting OVPF staff as saying “the earthquakes are probably precursory signs of a collapse beneath the summit zone” (Martel-Asselin 2007b). Thus, this was a relatively well-known hazard and an event for which the readership was well prepared. The Bory Crater takes his turn to threaten. “The greatest caution must be taken when flying over the volcano and lava flows in light aircraft; some have suffered damage related to dust emission or unpredictable turbulence”. Overfly Piton de la Fournaise from the ultra-light base of Cambaie. Special rate of 145 euros during the duration of the eruption for a return trip direct to the volcano! Agency and telephone number redacted. Supported by a photograph of a vent feeding an extensive, braided, lava channel system the advert ran for four consecutive days. Previously, on 12 April, a full page article had appeared on page 9 of JIR featuring the ultra-light flight industry for volcano tourism and over flights. Thus, although the readership was well and soberly informed on the hazard, there was still an element of tourism and sightseeing to the frame. The lava frame was dominated by spectacular photos of incandescent fountains feeding lava channels, flow fronts and ocean-entry flows (e.g., Fig. 6). The lava tended to dominate the photo montages and front page flags, and was associated with tourism and photography, the problems caused to the local population being of secondary importance. These lava flows were thus portrayed as an attraction rather than a threat. For example, on 3 April the three-page photo montage (JIR, 3 April 2007, pages 36–38) was dominated by spectacular color images of incandescent lava channels and ocean-entry lava surrounded by sightseers, as was the front page (Fig. 3). Hence our flash tests returned memories of images such as a tourist’s “hat” and the color “red” (Table 2). 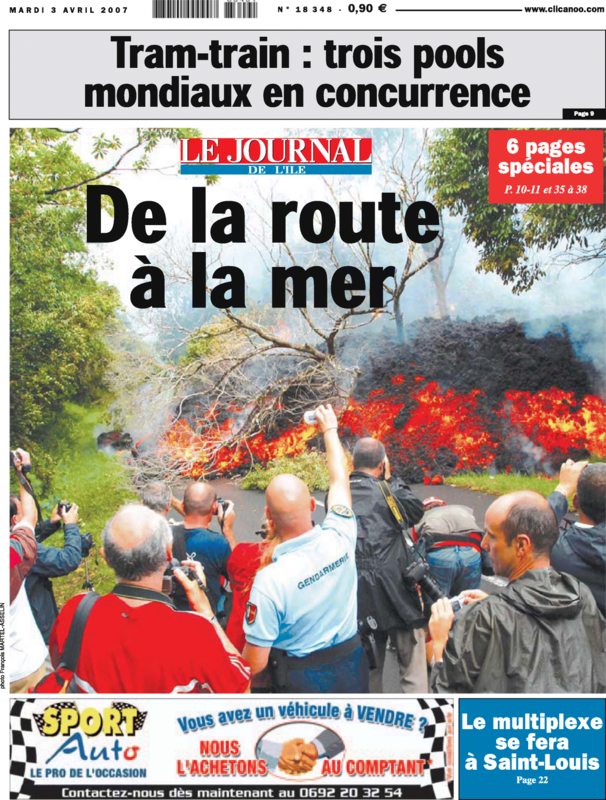 It was only late in the eruption that the front-page frame for lava became less voyeuristic, with the front page of 27 April featuring an image of lava flows moving up the road into Le Tremblet, with emergency services at-hand for forest fire damp down, under the headline Lava on the road towards Le Tremblet (Fig. 11). 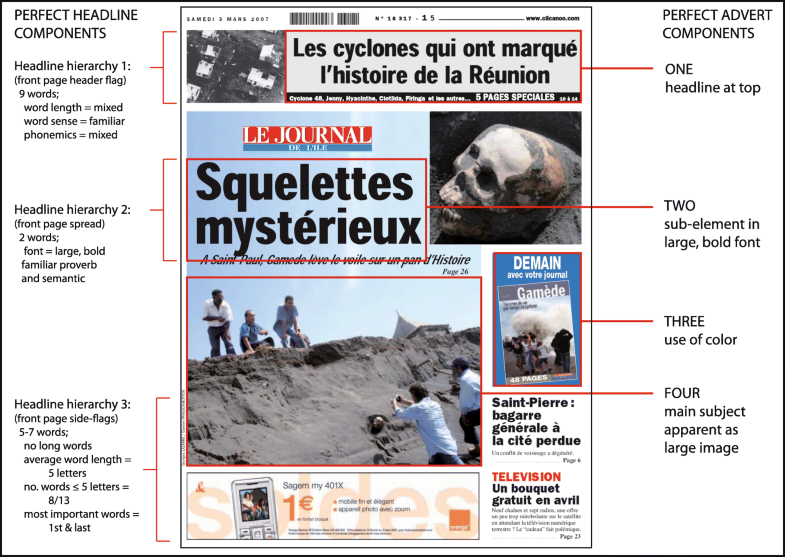 In addition, a four-page-long review of the 1977 eruption and invasion of Piton Sainte-Rose appeared in the Sunday Magazine supplement of 8 April (JIR, 8 April 2007, pages 14–17). However, the problems caused due to the closure of the island perimeter road (RN2) due to lava inundation was reduced to a small (280 cm2) report in the bottom left corner of page 13 (JIR, 8 April 2007); and after the end of the eruption, issues regarding tourist access and sightseeing dominated reports. Thus, the lava frame was one of colorful spectacle and sightseeing on the front page, with the hazards being spelled out using text-only on deeper pages. Experience was thus a key factor controlling appropriate reporting and conveying of the gas hazard. That is, there had been no experience of gas emission and impact amongst the population or the journalist; for lava flows, there had been—it was a known quantity for which there was experience and memory so that frame was an informed one that was not associated with “fear” or “panic”. All the same, advice regarding the gas and ash hazard was given in reports contained within the issues of 4 and 5 April, with further advice regarding health effects of sulfuric acid being provided by a lung specialist on 7 April. As we see next, the ash hazard was framed in a similar way, not being associated with the spectacle and sightseeing, but instead creating worry and uncertainty; worse “fear” and “panic”. “An atmosphere of doom reigns over the village of Tremblet. After a sleepless night, people woke up yesterday under volcanic ash … … … Cut off from the world since Wednesday night, residents still live in fear of an eruption outside of ‘L’Enclos’”. I heard the other night that the eruption of Piton la Fournaise was being presented on national TV with the statement “It’s not a volcano anymore; it’s a monster.” The conclusion of this report once again makes local tourism professionals bristle. Tourism, following last year’s problems of shark attacks, dog baiting, and the “chik” (i.e., the disease chikungunya), already gives the island a negative image in the Parisian media. All the same, those living in the impacted zone were genuinely scared and anxious. They thus needed re-assurance, information and help. Thus the manner in which potential evacuation was communicated and executed became extremely important. “The police went by saying ‘leave.’ But you understand I have a business. Later, others returned to tell us that there was no danger … … … I really left at the last (possible) moment” (Leyral et al. 2007b). Others stated that “we like our life here; the volcano doesn’t make us scared; it’s an old friend” (Lutton 2007b). However, the experience had been a severe shock, such that a team of psychologists was deployed on 11 April to work with the residents of Le Tremblet (Lutton 2007c). The prediction amongst the response workers arriving in Le Tremblet was that the residents (Lutton 2007c). “will support very badly a wave of tourists armed with cameras to view the eruption. There will have to be a break in their suffering”. Feelings in Le Tremblet were thus similar to those experienced in Kalapana (Kilauea, Hawaii) where residents having undergone an intensely stressful and shocking experience resented the intrusion of tourists, sightseers and media into their zone of personal distress; thus beginning to develop symptoms of post-traumatic stress syndrome (Weisel and Stapleton 1992). Probably, a frame whereby a page 9 headline on 7 April suggested that Le Tremblet was “at the gates of hell” likely did not help. As a result, residents suggested that the evacuation should have occurred by 5 April (Leyral 2007b), and a quarter of the population had already left of their own accord when the evacuation order was finally implemented (Leyral 2007c). Some of the evacuees then stayed where they were when the evacuation order was rescinded (Leyral et al. 2007a; Leyral 2007). The negative frame was not helped by a dichotomy in statements such as the situation in Le Tremblet was “hellish” and “catastrophic”, while then claiming that the evacuation was “for nothing”. Likewise the response plan was both described as “well-organized” and “poorly-implemented” at the same time. By 11 April, the “new, miraculous fish” had even attracted the attention of the Natural History Museum of Paris (Graignic 2007), with the “mystery of the abysses” frame continuing through 12 April. An article published on 15 April went as far as to celebrate a “discovery Réunionnaise.” In contrast, the economic hardships of local fisherman, whose livelihood was at risk and to whom the loss of fisheries was an extreme concern (see Part 1), only received attention on the first day of the “hot water” story (9 April). However, these events were certainly not the “first”, “mysterious”, “new” or a “discovery”. During Fernandina’s 1995 eruption lava entered the ocean to result in the death of at-least 15 species of fish as reported by McCosker et al. (1997). McCosker et al. (1997) wrote that, “in virile competition with feeding seabirds”, they were able to capture a small sample of fish found dead or dying at the (ocean) surface. These fish died not just as a result of thermal effects, but also due to acoustic shock, dissolved chemicals, suspended sediments and embolism associated with rapid ascent, so that “most of the fish that possessed gas bladders exhibited such organisms distended from their mouths”; some, potentially, came from as deep as 1200 m (McCosker et al. 1997). Likewise in Hawaii, during ocean entry of Mauna Loa’s 1950 eruption, Finch and Macdonald (1950) noted that “by 17:00 (on 2 June, 19 hours after the eruption had begun) a line of steaming water extended half a mile off shore. In this water zone many fish were killed, to be seen drifting or washed up onshore”. The style of the coverage of the ocean entry during 2007 thus indicates excitement coupled with an ignorance regarding the process and its effects. Upon ocean entry, lava flow into water creates what has become termed a “bench”; an extremely hazardous location due to its instability and associated explosive activity (Mattox and Mangan 1997). Collapses not only take large amounts of land—and all standing on it—with it, creating a local tsunami of hot water, but also trigger lava–water interaction explosions that send bombs and blocks inland and, potentially, into tourist viewing sites (Johnson et al. 2000). The first bench collapse during the 2007 eruption was reported on 25 April, as an aside to a two page photo montage dominated by spectacular color photographs of active lava at night. Other photos included pictures of boats, jet skis and paddle boarders around the steaming water off-shore of the ocean entry. As a minor addition to an article otherwise set aside to the on-going problems of Le Tremblet on 27 April, further bench collapses were reported to have occurred “at 12h30, 16h and 16h30” on the previous day. Thus, although bench collapse is a well-known hazard in Hawaii (Johnson et al. 2000) and which has caused casualties in the past at Kilauea (Perkins 2006), the bench completely lacked a hazard frame. Defining, tracking and responding to frames during a volcanic emergency. The image dominated the front page serving as the background and/or center-piece for all other elements. From our flash tests, we find that the frame format defined was extremely effective in, in the words of Lippmann (1922), forming a consistent picture in the heads of the recipients regarding the volcanic hazards being reported. We have thus, here, provided an analysis framework that allows the way in which readers will receive and perceive information, communicated by newspapers during volcanic crises, to be defined and tracked. Unfortunately, in the case study followed here, only the well-known (lava flow and pit crater) hazards were framed well. Gas, air fall and ocean entry hazards, as well as the evacuation plans and the decision making system, were very poorly framed. Having defined these frames the next question to ask is: what can the volcanologist do to respond to a developing frame? The answer is: support positive frames, while responding to negative frames through pre-emptive measures. Measures will include scientific advertising (Hopkins 1923), that reach the community exposed to the frame, and press releases (Lewis 2012) that target the journalists building the frame. Business and industry often respond to negative frames, or take advantage of positive frames, through appropriately designed, timed and placed adverts (Harris 2015b). The same occurred in the cases examined here. On 10 April, the day after the fish story broke during the April 2007 eruption, an advert appeared on the same page as the fish story of that day by a garden depot offering special prices on various live, ornamental fish such as guppies and goldfish. We have already cited the adverts for over-flights of the Cratère Dolomieu following the collapse. We also note that adverts by various insurance companies offering coverage and banks offering loans following passage of cyclone Gamède, which caused extensive property damage across the island during 24–28 February 2007, ran throughout our study period, having begun to appear on 3 March, and running through mid-March. Buying advertisement space may appear unethical or vulgar to the scientist, but there are other means of advertising such as setting up open houses, film shows, exhibitions, etc., and then advertising their content, location and times, or by offering useable editorial or review material to a journalist. Although probably not in response to the frames highlighted here, such an approach was in fact implemented during the 2007 eruption. Eruption-related adverts first appeared in the Agenda section of JIR (page 63) on 16 April. There were two. While the first advertised a temporary exhibition to be run at La Maison du Volcan between 21 April and 21 October 2007 entitled “30 years on from the 1977 lava”; the second advertised showing of a film covering “all of the stages” of the 2 April 2007 eruption at the same location. The launch of the exhibition, to mark the 30th anniversary of the 1977 eruption, was supported by a small piece on page 23 of the 17 April edition of JIR entitled a “special volcano evening” which would be held on 27 April. These adverts ran daily through 25 April. Whether chance or not, the event was a perfect and timely opportunity to outreach and educate. Special sections, supplements and Sunday magazines are other good places for scientific advertising. 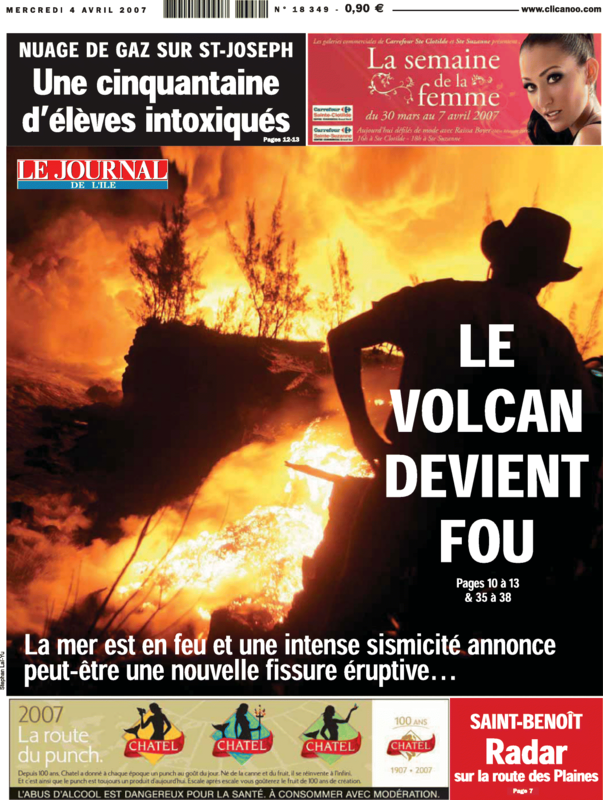 The Sunday Magazine (“Mag Dimanche”) of JIR was used during April 2007 to inform on volcanic processes, being used on both the weekends of 7–8 April and 21–22 April. The Sunday Magazine is an 11 page supplement appearing in the middle of JIR each Sunday. It carried multiple page reviews of, and background on, topical newsworthy subjects, as well as health, cinema, book and music reviews. 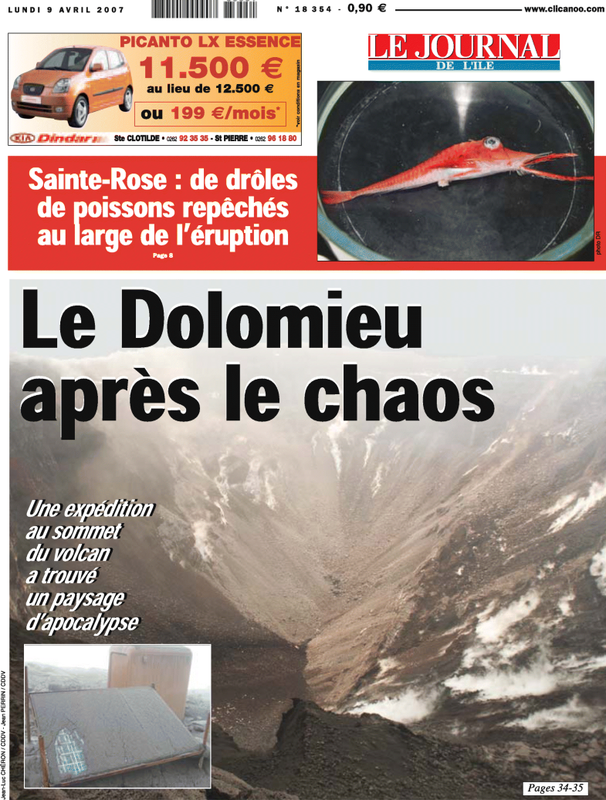 On 8 April, the Sunday Magazine featured a four-page-long review on the effects of, and response to, the 1977 effusive eruption of Piton de la Fournaise and its ingress into the town of Piton-Saint-Rose (pages 14–17). Then, on 22 April, a five-page review detailed the history of exploration of pit craters at the Cratère Dolomieu (pages 15–19). Unfortunately, though, only the well-known (lava flow and pit crater collapse) hazards were targeted. Given our content analysis, follow-up measures would have done well to educate, through web-site postings, public presentations, and fact sheet releases, on gas, air fall and ocean entry hazards as and when the hazards occurred, as well as to better communicate evacuation plans and the decision making system. Although Russell (1986) identified that specialist science journalists generally have good scientific backgrounds, the non-specialist journalist may have difficulty understanding complex issues and interpreting numeric data (Voss 2002). Recognizing this problem, Smith et al. (2005) placed the onus on the scientist, suggesting that poor science writing could be improved if scientists “took the trouble” to communicate effectively with the journalists. As a result, Woloshin et al. (2009) argued that scientific bodies should work harder to promote accurate translation of output into news, while making it “easier for journalists to get it right” by ensuring that press releases routinely present and describe the situation. In fulfilling this need, Slovic (2000) recommended that scientists should understand that risk and uncertainty are inherently difficult to communicate, but that the media are the dominant source of risk information. Thus, Slovic (2000) argued, scientists should be proactive in enhancing science writing by educating reporters on the importance and subtleties of risk stories. Peters (1995) added that, while Journalists accept entertainment as a function of mass media more readily than scientists; scientists have little understanding of the journalistic need to attract and fascinate readers by means of certain stylistic elements. What these findings and recommendations amount to, are (i) if a need for information by the journalist is identified, (ii) the journalist should be approached, with (iii) information selected and presented in a way that is useful to, and useable by, the journalist. Tracking the frames developing during a volcanic crisis, and identifying the design of that frame, is a way to ensure that the information provided is appropriately selected and presented; an approach that understands the stylistic elements of the news design applied. The formal means to outreach information to the mass media is through a press release, where Slovic (2000) recommended the development of science news clearinghouses, arguing that reporters need to know how and where to access relevant, knowledgeable and cooperative sources. On an agency or institutional level, this would be a press office or press officer—a point of contact that the journalist knows and trusts to be a pertinent information source. In the case followed here the frame that needed to be rectified was well-defined, the exact need for information was known and the publisher contactable, so that direct contact from the volcanologist to the journalist was the obvious option. In part 1 of this work, we identified the fact that reporting on Piton de la Fournaise’s April 2007 eruption in JIR benefitted from the fact that specialist science writers were involved. Better, there was already a good relationship between the observatory and the journalist allowing direct and immediate communication, and that communication route was plainly used, there being almost daily quotes from OVPF staff and their bulletins in JIR (see Part 1). The key is, though, to identify the need for information and provide information that fills any knowledge gaps that develop. Generally, as a gauge for information content, the front page of the JIR was always a mirror for its contents, with the frame delivered by the front page being supported by the responses of the flash tests. Although, as found in part one of this study, the quantity and quality of hazard information was excellent, the way in which it was framed was not so positive. Not surprisingly, hazards related to frequently experienced, and hence familiar, volcanic phenomena (lava flows and pit craters) were well-framed, but those relating to unfamiliar phenomena (widespread gas effects, air fall, evacuation and ocean entry/bench collapse) were not. Pit crater collapse and lava flow hazards were framed using their natural colors and using clear imagery of the phenomenon, although—for lava flows in particular—there was an element of spectacle and promotion of sightseeing. Gas and ash fall hazard became framed using images and words of the victims, so that it became worrying and frightening, and associated with panic. As a result, the volcano became framed as a monster and situation apocalyptic and hellish which, within the framework of SARF (Kasperson et al. 1988), amplified the risk and built fear. This probably contributed to the evacuation measures being framed as confused and pointless. In contrast, the ocean entry and bench collapse had no hazard-frame at all, and instead became associated with the exotic fish that bobbed to the surface. Thus, this volcanic process became attenuated to the point of it not existing as a risk; but being framed simply as a curiosity. This was due to the hazard being beyond the experience of the reporters. In tracking the frames apparent in the media, there is an opportunity for the volcanology community to understand how people perceive volcanic hazard based on material published in the mass media during a volcanic crisis. We can use this knowledge to act on gaps and misconceptions that appear as they are published. If we have real-time knowledge, we can respond quickly through the use of internet (professional websites, professional social media accounts, etc. ), addressing concerns at town hall meetings and (well-advertised) public presentations, and by contacting reporters with appropriately selected and presented information. In all cases, the needs, understanding, perception and concerns of the recipient will have been pre-empted through an appropriate analysis of information disseminated by the mass media and its frame. We are extremely grateful to all participants in the flash tests for agreeing to participate and for consenting to use of the results. Two anonymous reviewers, and the associate editor (Ilan Kelman), provided excellent advice on how to better communicate this work and its implications. We are also exceedingly grateful Philippe Le Claire (Director of the JIR) for granting us permission for reproduction of JIR material and front pages in support of this scientific application. This is ANR-LAVA contribution no. 3. Raw data used here were PDF copies of the newspaper “Le Journal de L’Ile de La Réunion” (JIR). These PDFs are available (for purchase) from https://www.payandread.fr/4DACTION/NewSwitchPublication?publicationID=18 https://www.clicanoo.re/. Argument support taken from each PDF is given as referenced. We provide here the results of our headline analysis which is given as an EXCEL spreadsheet in the electronic supporting material (Additional file 1). Also given in the electronic supporting material are the results of our flash tests for group A (Additional file 2: Group A), group B (Additional file 3: Group B) and group C (Additional file 4: Group A), with – for the sake of anonymity – all names removed. Both authors have reviewed this manuscript and contributed to its content. Both authors read and approved the final manuscript. Harris AJL, Villeneuve N. Newspaper reporting of the April 2007 eruption of Piton de la Fournaise Part 1: Useful information or tabloid sensationalism? Applied Volcanology. 2018. https://doi.org/10.1186/s13617-018-0072-2.